Hitler has resurrected the dinosaurs and enlisted them in the Nazi war machine. Uh-oh. "The year is 1942. Adolf Hitler has succeeded in resurrecting dinosaurs. The reptilian horde has trampled Europe and the Mediterranean. 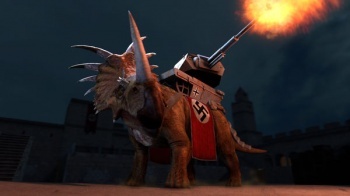 Can nothing stop the Nazi's dinosaur army?" It's been almost a year and a half since we first (and last) wrote about Dino D-Day. The game was originally slated to come out in 2010, but then we didn't hear anything about it for a very long time. The schedule slipped, and the release date fell to April 8th, 2011. Why, that's today! Who'da thunk it? As we said last time, the sheer novelty of adding dinosaurs as playable classes to a multiplayer-focused shooter is perhaps the perfect way to spice up the done-to-death "WW2 FPS" genre. Nazis with Tyrannosaurs - it's perfect! Why didn't we think of this before, huh? According to the Steam page, the game includes three dinosaur classes - Velociraptor, Dilophosaur, Desmatosuchus - and nine boring old human classes, three of which belong to the Axis and six of which belong to the Allies (sorry, General Eisenhower, no dinos for you). Judging from the screenshots, however, there are also non-playable dinosaurs like "kamikaze pterosaurs" and triceratops with tank cannons on their backs. I have no idea if 800 North and Digital Ranch's game is actually going to be any good, but the premise is so cool that I have to give them a shoutout anyway. Anyway, it's out today (at time of writing, the Steam page says it unlocks in an hour) and will only set you back $20 if you choose to pick it up. Someone get this over the weekend and tell me if it's any good on Monday, okay? As the description says: "You've played World War II games before ... but have you played a World War II game with dinosaurs?" No, good sir. No, I have not.